50 years is a muscle classic car to be more specific, the 64 though 70 and even some up to 76 american muscle cars are a different breed of classic, hence the appreciated prices are based on desire to own one. Trucks also fit this bill and have different levels of appreciation. What you are paying for is either original or aftermarket restored, but ground up builds are nice also. Now that they are remaking compete shells or bodies for the 60's muscle cars, you can save those models and drive them like new for a very long time. You just need a donor vehicle for the registration and vin numbers. A brand new vehicle for 30K turn key, or build it yourself and customize it anyway you want and spend a lot more, or go buy a vehicle for 40k and hope it last 10 years while spending thousands to keep it up, no thanks. If you have money to burn and time to fix them or know someone who does and can then buy one. nice, like my 68 midnight blue ram air gto body off restore done by myself, its not that hard. You are the only one who admires your classic car nowadays. Nobody cares about them anymore. You are the only one. Its in your head. Break this spell so you can start saving money to pay for a house. Don't care what anybody else thinks. The car is for me, not them. I like classic cars. 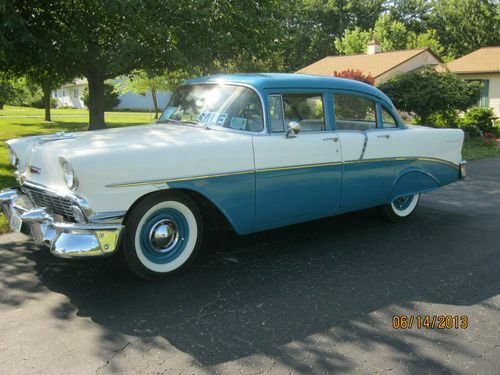 My first car was 1956 chevy. You stole my car. I been looking for the thief who stole this car for me for years. Found you finally! I bought mine in Portland, OR, in 1976 for $450. It didn't have the fender skirts. 265 V8 and 2 speed Powerglide transmission. About 75K miles. Yeah that sounds about right. You thief! That's my car. I can tell you that there's a little bit of chip paint somewhere at the back bumper. Go check it out. Oh Im sorry. I just realized that Im only 48 year old. in 1976 I was only 5 year old. The one stolen from me was a 1976 Ford Mustang. They looked similar. So I accused you of stealing. Sorry about that. For this reason alone, I have to go with gut. Classic cars made of METAL do last usually. Look at the old VW bug. New cars and products, unfortunately aren't made to last. When dudes in the 80s, 90s and 2000s were buying classic cars to impress young women, THOSE women had no personal memories of classic cars either. ANY young woman of ANY generation is not going to have associated memories of a car that stopped being manufactured before she was born. NONETHELESS, driving around in a rare, shiny, powerful, expensive car, always has been, and always will be, attractive to women. It's rare, it's a status symbol, it draws looks. That's why she likes it, not because her dad used to have one. If your line of thinking was valid, a guy driving around in a beat up old Ford Taurus would have women throwing themselves at him. There is only one reason to not buy a classic car - you can't afford it. If you can afford it, and you want a classic car, there is no reason NOT to buy a classic car. A 1960s muscle car used to be cool 20 years ago, and women do want to sit in it. Nowadays? No. No women want to hop inside a muscle car. They rather see you drive a modern and clean Toyota or Benz.